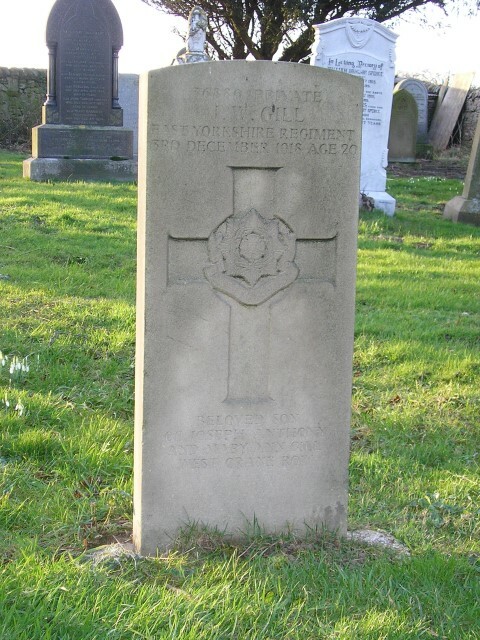 36880 Private John Walton Gill, 7th Battalion, the East Yorkshire Regiment died of wounds 3 December 1918 and is buried in Hamsterley (St. James) Churchyard, near Bishop Auckland, County Durham. He was 20 years old and is commemorated on the Woodland War Memorial and the memorial plaque in St. John the Baptist Church, Lynesack. During this time, the German High Command had launched its spring offensive and the British and Allies were pushed back all along the Western Front until 8 August when at the Battle of Amiens, the 17th Division as part of the Australian Corps, Fourth Army  advanced in what General Erich Ludendorff would call, “The Black Day of the German Army”. Private J.W. 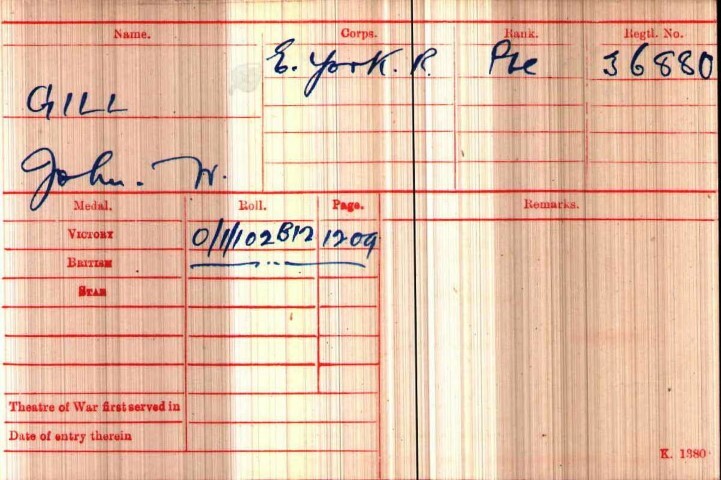 Gill was back in France 11 October 1918 and posted to 7/East Yorkshires 12 October. The 17th Division was now part of the V Corps Third Army as the Allies pursued the German Forces to the Selle and the Battle of the Selle raged from 17 to 25 October. The Bn was still at rest in NEUVILLY….Warning Order was received at 15.00 hours that the Bn would move into the line on the 2nd. …Warning Order was sent round to companies that the 17th Division would take part in an attack and that the Bn would move to VENDEGIES at 18.00 hours….The Bn fell in ready to move off at 18.55 hours…Orders were received…that the Bn would move to Assembly positions in area NORTH of POIX-DU-NORD. 4 November: 10.15, the battalion moved forward and maintained touch with the Sherwood Foresters and came under very heavy machine gun fire and artillery fire from Futoy. By 12.59 the battalion was in position to advance to the 3rd and final objective but a message came from the Dorset Regiment at 13.00 that it was held up and not advancing without further orders. Lt.Col. G. East-King immediately sent written instruction for them to move forward to protect his left flank. British artillery fire fell short and hit the rear of the assembly positions which lasted until 15.00 hours. The leading troops contacted the Dorset Regt. but were at this time held up by machine gun fire. Lt.Col. G. East-King sent men to outflank the machine guns to attack from the rear. This was successful and the area was mopped up by 16.40. Six machine guns and 12 prisoners were captured, 14 enemy soldiers were killed. Battalion casualties were 2 officers killed, 2 officers wounded and 100 Other Ranks. At 23.00 orders were received to hold the advance. 5 November: 00.20hours, orders received to continue the advance to the final objective. Lt.Col. G. East-King instructed 3 platoons to move forward and 5.30 had gained their objective without opposition. At 06.00 hours, the Lincolnshire Regiment passed through and continued the attack. The Battalion captured 20 machine guns, 3 field guns and much equipment, 16 prisoners. 30 Germans lay dead. 8th Nov: 03.00hrs Conference of Coy Commanders in which C.O. explained role of Bttn in next attack. Billets in Bachant.